Nearly a decade ago, my cousin and his family came down from New York to visit and for some reason he brought me a little container of muhammara from a Syrian grocery store near their apartment. 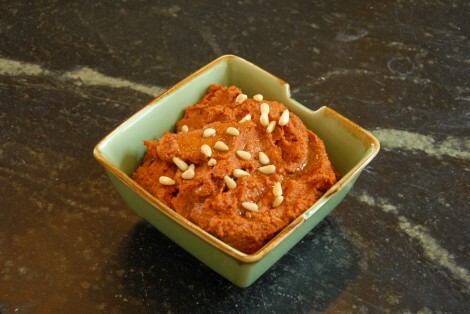 I had never had muhammara before, or knowingly expressed any interest in Syrian food to him. However, here it was, a little 8 ounce container of a deep red, slightly granular spread. I think I finished it. I don’t mean that weekend, or that I took the last bite. I mean I think I took the container, and finished it, right then and there. Rude, I know…. But there was something about that spread – sweet, tangy, a little spicy – somehow both exotic and comforting all at once. I was hooked. The next time in was in New York I tried to hunt down the source, but I think either it was closed down or I had the streets wrong – I never found the source of that original muhammara. Fortunately I learned to make my own soon thereafter. In addition to being a fantastic dish on it’s own, muhammara introduced me to Aleppo pepper, starting a local quest to find the sweet, spicy, slightly smokey flavor component of this Syrian spread. Eventually I succeeded in locating Aleppo pepper at Penzey’s, and of course now there are dozens of internet sources that can deliver it to your door step. Where ever you find it, I suggest picking up a few ounces if you haven’t tried it before. I may replace chile flakes for you, as it largely has for me. Preheat oven to 350 deg F (190 deg C). Place walnuts on a sheet pan, and roast until toasted and turning brown – aprox. 8-10 min. Watch them carefully, shaking and turning the pan occasionally. Do not let them burn – they go from toasty to unusable in just a few minutes. After allowing them to cool completely, place the walnuts in a food processor. Pulse, in 5 second pulses, until the walnuts resemble coarse bread crumbs. Do not over process, or the texture will change and become paste like. Once the walnuts have been ground up, scoop them into a bowl. Combine the remaining ingredients in the food processor, and process until nearly smooth. 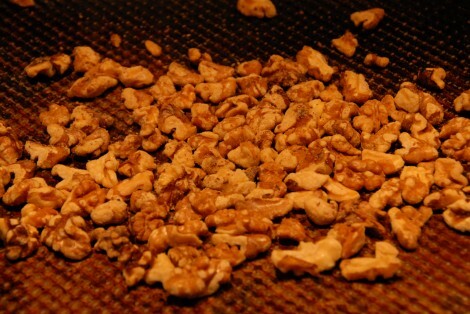 Add the walnuts back to the processor, and pulse to blend – 5 to 10 seconds at most. 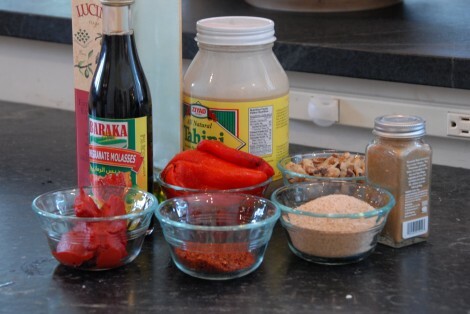 Plate the muhammara, and garnish with olive oil and pine nuts, if desired.